Pack 2 and its films continue from Starter Pack 1. 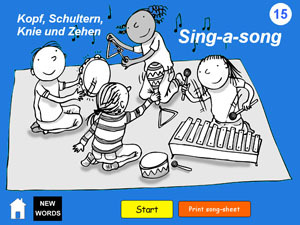 It builds on the language children have learned, and helps stretch and extend young beginners. They find out about everyday life and culture in Germany, with strong links to popular topics across the curriculum - especially the environment. ...followed by some German children from Freiburg introducing "My School" - a school which is featured in several chapters throughout the Pack. It's full of practical teaching ideas using the sample movie about 'My school'. Each chapter in Pack 2's Teacher's Manual is full of suggested activities to develop the language and explore the culture and cross-curricular links shown in the films. It acts as lesson-planning guide for the non-specialist. Follow a recipe - in German! 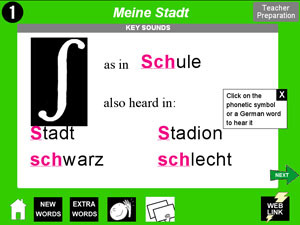 Add interactive activities with the Interactive CD-ROM 2 to use as part of your scheme. (optional extra). 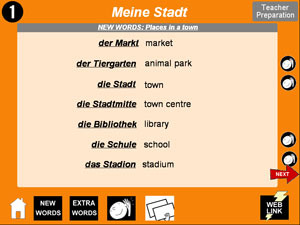 in a flexible spiral curriculum looking at "where I live"
3 Wie kommst du in die Schule? - How do you travel to school? 7 Wie spät ist es? - What's the time? 9 Wann ist dein Geburtstag? - When is your birthday? 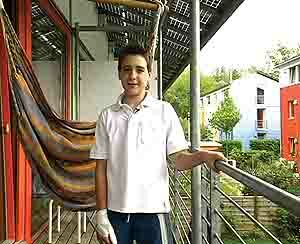 13 Was ist dein Lieblingsessen? - What do you like to eat? 14 Guten Appetit! - Enjoy your meal! We see young football fans come to the match by bike and tram - with detailed support in the Teacher's Manual for developing lessons. 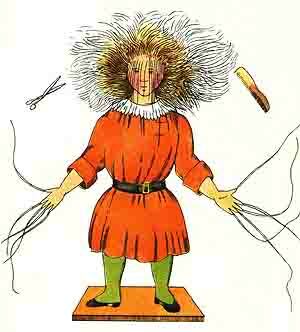 Activities in the Teacher's Manual include links to well-loved children's tales of German origin, like Struwwelpeter, ('Shock-haired Peter"). Each topic has suggested cross-curricular activities, including writing simple picture stories with "talking word-processors" like Clicker 5 and exchanging information with a partner school. Matchs the KS2 Modern Languages Framework, and the "Languages Ladder" accreditation scheme. the same films, Teacher's Manual and NEW e-flashcards. ... then buy MORE PACKS for your colleagues at HALF PRICE!